Flying two flags, this island is half-French and half-Dutch. Cruise ships more commonly call on the Dutch side of St. Maarten, known for its shop-lined, narrow lanes and daytime casinos. 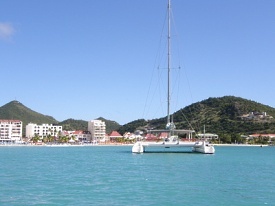 Island tours, cruising on an America's Cup yacht and snorkeling excursions are offered in Philipsburg. Golfers should check out Mullet Bay. The Port of St. Maarten is located approximately a half hour from Princess Juliana International Airport. Exit the airport, and head northeast down Airport Rd for 2km. At the roundabout, take the 2nd exit to follow Airport Rd for 2km, then take the 2nd exit at the roundabout. Drive for 1.2km to reach another roundabout, and take the 1st exit onto Union Rd. Drive on Union Rd for 2km, and at the roundabout, take the 2nd exit onto A.J.C. Brouwer Rd and drive for 1.5km. At the roundabout, take the 4th exit to stay on A.J.C. Brouwer Rd for 1.5km, then take the 1st exit in the roundabout onto Bush Rd. Drive on Bush Rd for 1km, then turn left onto Prins Bernard Brug. Continue down this road for 1.5km and once you reach the roundabout, take the 2nd exit and stay on Walter A. Nisbeth Rd for 1km. At the next roundabout, take the 1st exit onto W.G. Buncamper Rd, which turns into Juancho Yrausquin Blvd, your destination.